School has been back in session for about a month. Not to pat my back with too much enthusiasm…but I’ve been pretty good about making a food schedule and sticking to it. It has made mornings easier and the dreaded what’s for dinner conversation a breeze. Three things have made this a success in our house- first, I take the time to sit down and schedule out meals on the night before I go to the market. I know, it sounds like a no brainer- but it isn’t something we usually do. We are impulse shoppers. But impulse shopping sometimes means all the food is gone before the next grocery trip and there is no real plan. Second, and I know this is totally ‘Virgoish’ and maybe a little OCD…we have an inventory of what we have on hand. It is easy to forget about that jar of couscous or the pack of no bake lasagana noodles that are hiding in the back of the cupboard. By utilizing the inventory we are sure to use what we have and not buy the same thing twice. The final thing that has really made this work is prep work. By making sure some things are prepped earlier in the week cooking meals becomes much easier. At least for me. One of my favorite books on cooking ahead is Ina Garten’s Make it Ahead. 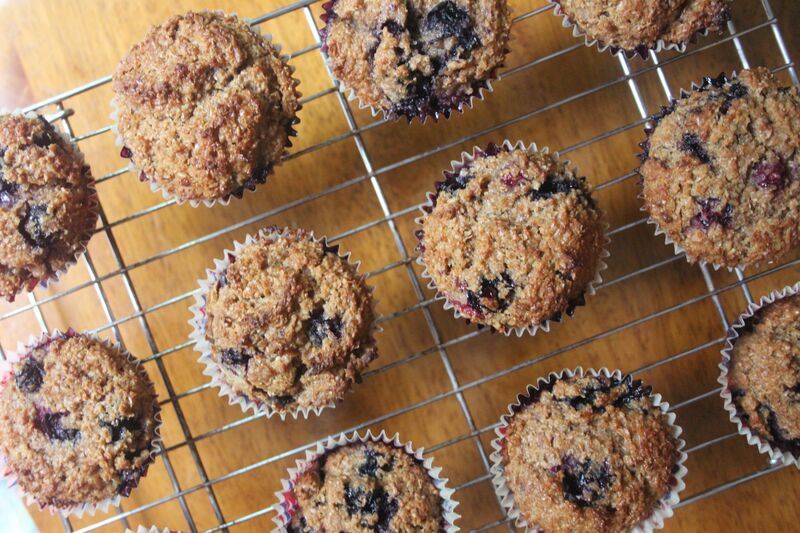 We love her recipe for Blueberry Bran Muffins because the batter can be prepped the night before, left in the fridge and then scooped into muffin tins the next morning for yummy, warm home-baked breakfast treats. As promised, they are moist and filled with blueberries- two things that, in our opinion, make muffins great. We used local honey and farm bought eggs to make these even better. What is your favorite make ahead breakfast treat? We’d love to know!